Added by Lenz Grimmer 9 months ago. Updated 6 months ago. 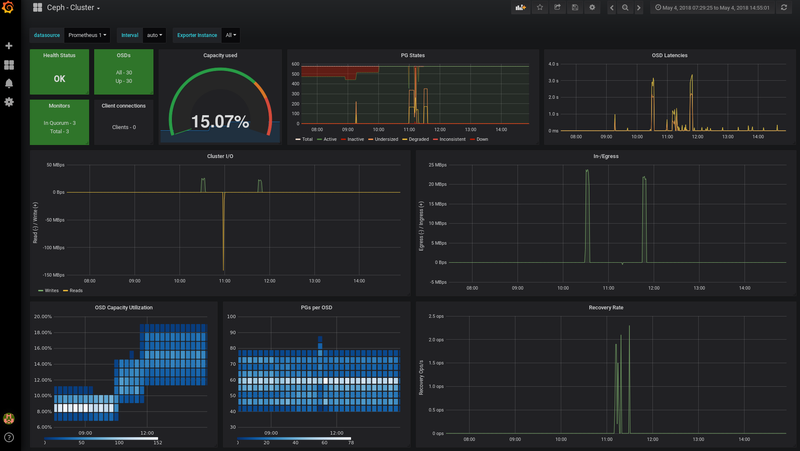 The Ceph Manager Dashboard intends to embed Grafana dashboards into various places of the UI. The ceph-metrics project already provides Grafana dashboards for all of these parts, so the intention is to convert these (e.g. remove the alert management and embedded navigation items) and submit them for inclusion in the Ceph git repo for consumption by the Manager Dashboard. I've attached screenshots of the current state of the dashboards that I've been working on to port from cephmetrics to the integrated grafana dashboard instance. Thx for the update and the screenshots. I'll list a few things that jumped at me while looking at the screenshots. Some will no doubt be a matter of taste, others might be me misinterpreting things. With a PR I could probably give more informed feedback. As an aside: are these dashboards meant to live in the ceph repo in the future? fill: I notice that most graphs have fill=1. My suggestion would be to reserve fill for stacked plots, whereas non-stacked should have fill=0. This just helps distinguishing which is which on sight. Personally I prefer linewidth = 1 in all plots. Again a matter of taste, however I find it helps with clarity graphs with lots of line plots. I think this is on a good way! I think pushing this to the ceph repo would greatly help discussion and the distillation of a "basic theme", i.e. a general preference in line width, fill settings and such. Historically I've used fill=1 to make the graph stand out more against the light theme - especially with linewidth=1 and some of Grafana older palette choices! For stacking, I can see where you're coming from. I tend to stack network throughput so at a glance you can see total load as opposed to adding two or more values in my head (I'm just lazy!). This approach also helps when you stack total load from all hosts so you can potentially see underused RGW's (i.e. load balancing issues). I tend to use linewidth=2 for 'red line limits'. So in the case of RAM I show a red line which indicates available ram - the only other place it's used is pool-overview and that's not a red-line-limit, that's a bug..I'll fix that. Jan - as far as the min version is concerned. IIRC, all the changes we needed to support prometheus with cephmetrics went into 12.2.5 - so the charts we have in this PR should be fine. Boris could confirm. Regarding "stacked vs not" and transforming rx/tx on a negative scale, it's an interesting idea but I have usability concerns about it since having them as rx/tx on opposite scale of the x-axis would make it difficult to do comparisons or even to look at it from a total (rx + tx) perspective. Seems like the "linewidth = 1" references a bug at the time which I think Paul Cuzner has addressed. As for fill=1 or 0, let's wait till we capture some user feedback as well as running Ceph Dashboard on some larger scale deployments to do some performance and scalability testing so we can see how Dashboard performs in different situations plus we can also see how we well the Grafana dashboards perform and make adjustments if needed. We'd be happy to go through this with you and the Ceph Dashboard community once we get some of this testing underway.